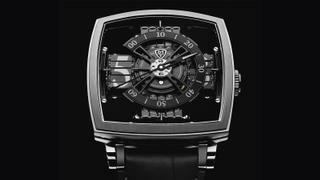 The face of a Metiers d'Art watch is a blank canvas to a veritable academy of artistic sorts, from enamellers to sculptors, reports Alex Doak. Even the most long-in-the-tooth trade show veteran is left slack jawed at the annual extravaganza that is Baselworld. The biggest date in the watch calendar has received a recent investment of CHF430 million, resulting in a new Herzog & De Meuron-designed extension as dazzling as any high concept Philippe Starck superyacht. Inside, towering pavilions each bear the logo of a fine watchmaker. Come June, just two months after the watch brigade flies home, Basel’s exhibition complex is a very different thing indeed. It is filled with 4,000 artists’ worth of paintings, drawings, sculptures, installations, prints, photography, video and digital art – enough to fill nearly 300 galleries. This has inspired a watchmaker or two to stick around. As global associate partner, Audemars Piguet has installed its own conceptual pavilion at all three Art Basels – in Miami Beach and Hong Kong as well as its Swiss original – since 2013, collaborating with a different band of young artists and designers every time. And it’s not, as you might think, just a cynical way into another congregation of wealthy browsers clutching blank cheques. For, like most of its contemporaries, this venerable maison crafts mechanical watches that could be considered kinetic art. Despite needing to arrange three hands and 12 numbers in a circle, designers can be creative in every other way. The influence of classicism, baroque, art deco, Bauhaus and pop art have all crept into catalogues over the centuries. Andy Warhol was a watch collector (Rolex), and Swatch (a pop art icon in its own right) continues to run sporadic collaborations with contemporary artists – Keith Haring, Mimmo Paladino and Sam Francis notable among them. The art and the watch world are undoubtedly intertwined. 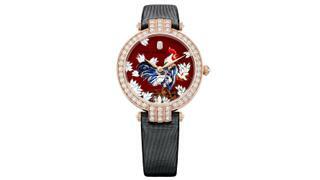 But what of artistry applied to the watch by the hands of the artists themselves? Though watchmakers are a jealous breed, liking to keep things within the Swiss companies’ closed cottage industry, it does occasionally happen. Just recently, collector’s collector brand Greubel Forsey (average annual output 110 watches; average price tag £375,000) collaborated with British “nano sculptor” Willard Wigan. Their Art Piece 1’s side-mounted, micro microscope affords a glimpse of a tiny tall ship, rigging and all, agonisingly hand-filed from gold between heartbeats. 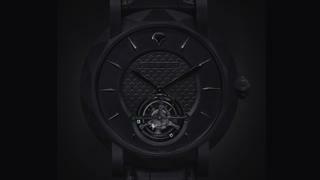 This year, futuristic mechanical watchmaker MCT was granted rare permission from Anish Kapoor to use a carbon coating called Vantablack, over which he commands creative exclusivity. A microscopic “forest” of carbon nanotubes, Vantablack absorbs 99.965 per cent of visible light, meaning celestial telescopes suffer less interference. MCT’s Sequential One 110 Evo (pictured top) qualifies as the darkest watch dial ever printed. However, given the unusual medium, and the rather different skills required to tackle a watch as a blank canvas (just you try screen-printing or daubing oils on to a dial), artistry in watch form usually commands a genre all to itself. It’s known as métiers d’art – or, rather more prosaically, “artistic careers”. 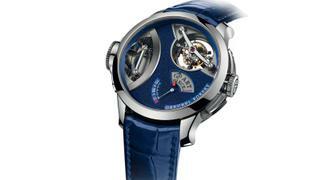 Like so many things in watchmaking, religious vagaries have a part to play. It was the revocation of the Edict of Nantes by Louis XIV in 1685 that, thanks to Protestant Huguenots no longer being allowed to safely practise their religion in France, saw the persecuted Calvinists soon hot-footing it over the border. Luxury objects were banned so the more quotidian but lavish craft of watchmaking flourished in Switzerland – along with the first decorative dials. Hunched over these miniature canvases, using brushes a hair in breadth, they ushered in a new era of watch design. It was one that was to dominate the horological scene for the next 200 years, with its heyday occurring in the 19th century. Other traditional métiers d’art include hand engraving (Panerai drawing from hometown Florence’s rich pool of master craftsmen), miniature painting (look no further than Harry Winston’s Year of the Rooster tribute, back in January), gem-setting (Graff, hands down) and enamelling. The latter is arguably the ultimate horological métier d’art, even further sub-divided: cloisonné, where the pattern is marked out in fine gold wire, the cells filled with layer upon layer of enamel fired at different temperatures; and champlevé, which requires the engraver to incise the metal of the plate to form the design, with the hollows being filled with enamel one colour at a time. One of the greatest enamellers working today is Anita Porchet. The Frenchwoman is pulled pillar to post by the likes of Vacheron Constantin, Chanel, Piaget and Jaquet Droz – all keen to capitalise on the huge value imbued by her artistry. Just look for the tiny “AP” initials at five o’clock. 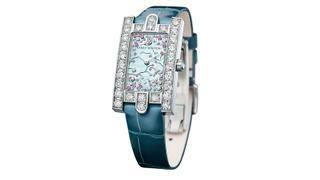 Her tutor was Suzanne Rohr, a legend in her own lifetime, now working exclusively for Patek Philippe. The “art” has been put back into Cartier too, with Richemont Group’s flagship brand converting an 18th century farmhouse near its watch atelier in La Chaux-de-Fonds into a five storey hothouse of mixed media creativity. From champlevé and cloisonné to the more unusual crafts of wood marquetry and even filigree – which dates back to 3000BC and creates patterns using twisted and hammered gold wires – it has all been gathered under this one roof, with the purpose of preserving these more esoteric crafts. 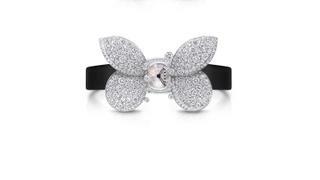 “Most did not exist any more, so we had to recreate them,” explains Pierre Rainero, Cartier’s image and style director. “We want to bring beautiful objects to our clients, and to the public, but also to keep this craftsmanship alive for as long as possible.” As long as the crowds continue to throng both Baselworld and Art Basel, there’s no reason why it shouldn’t thrive.